The Nexus XR25 P25 Transceiver Board is a small form-factor, off-the-shelf, advanced hardware and software platform for public safety and other demanding radio communications applications. It is available in three RF variants: VHF, UHF and 700/800 MHz. 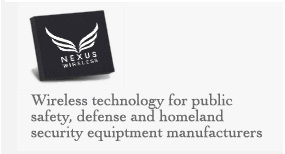 Nexus has combined modern, high-integration hardware devices with advanced software in a compact form factor to create a robust, high performance radio platform that meets the exacting public safety requirements of today and tomorrow.Flexible licensing of hardware and software and a range of manufacturing options make the XR25 the ideal solution for small or large manufacturers wishing to penetrate new markets or consolidate existing markets with minimum risk. At the core of the XR25 is an advanced digital IF architecture, combined with state-of-the-art microprocessor technology that yields high performance processing for minimum power consumption, maximizing battery life in both conventional and trunking applications.A highly efficient PA design allows the same hardware to be deployed in hand portable and mobile configurations without modification.Support for a full range of peripheral devices is integrated into the platform, including internal and external microphone and ear/speaker amplifiers and codecs, a full-screen color LCD display driver, plentiful keypad and switch inputs, multiple serial and USB interfaces, and smart battery support.All interfaces are brought out to a single connector for ease of assembly of the packaged product. The XR25 comes with a standard suite of software with flexible licensing options. The modular software architecture fully supports customization and SDR-grade reconfigurability.Off-the-shelf software modules currently available include conventional analog FM (CTCSS and DCS), and conventional and trunked APCO Project 25 – including essential advanced features like encryption and OTAR.Encryption & Security, Ready to GoThe XR25 has been designed from the outset with FIPS-certified security in mind, and incorporates the Nexus FIPS-140-2 P25 Crypto Module as a standard option.Based on a powerful DSP processor, the plug-in FIPS module is responsible for cryptographic functions and secure key storage, and is certified to FIPS 140-2 Level 1 for AES and DES encryption. The module can easily be removed for re-certification without disturbing the host XR25 platform.The FIPS module implements a standard keyfill device (KFD) interface that the XR25 routes to an external connector.